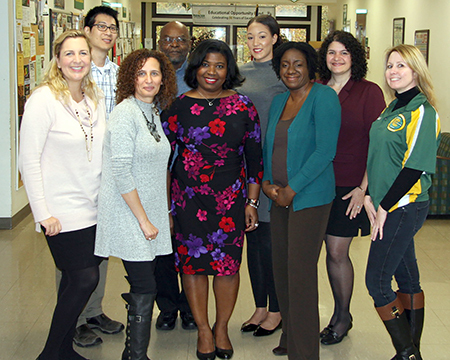 West Windsor, N.J. – Mercer County Community College (MCCC) students are diverse in every way imaginable. So it’s no surprise that to truly make a difference in student success, Mercer’s support services must be individualized, holistic and proactive. Thanks to a $2.25 million Strengthening Institutions Grant awarded to MCCC in 2016, the college has been able to invest significantly in enhancing those services. Now in its third year, the initiative has allowed the college to expand its student services staff, including three full-time success coaches (in addition to numerous part-time coaches). According to MCCC’s Director of the Center for Retention and Completion Dr. Latonya Ashford-Ligon, coaches provide personalized, holistic support focused on problem-solving and academic success. “Coaches start building relationships as soon as students reach out or are referred by their professors. They may become the student’s ‘go-to’ support system throughout their time at Mercer,” Ashford-Ligon said. MCCC coaches have also hosted seven student workshops since Spring 2017. The most recent was a "Meet and Greet" on Feb. 5 that introduced students to the wide range of support services available at Mercer. Other topics have included assessing academic strengths and familiarizing students with enrollment and registration processes. Additionally, the college has improved its customer service with call centers for financial aid and other payment questions, where trained professionals can answer students’ questions quickly. It has made the College Success Workshop (CSW) a required two-credit course in many programs, giving first-year students key rules and tools for college success. And, through new software known as Career Coach, students can now take a free predictive assessment that targets their strengths, recommends programs of study, and connects them to relevant job placement data in our region. 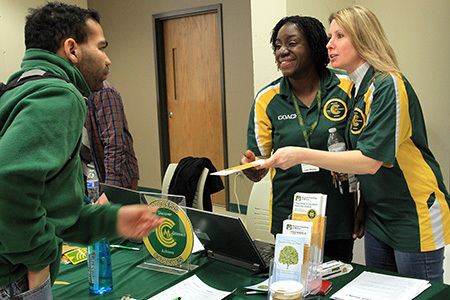 The "Meet and Greet" on Feb. 5 gave students a chance to meet success coaches and other staff members dedicated to their success. On the spot advisement by Success Caoch Jehad Mohammed. The staff is dedicated to student success!